This month I was looking forward to this Goddess Provisions box the most. Why? Because, there was a stunning rose quartz sphere in this box and a 100% Pure lip gloss! I've been wanting a rose quartz sphere for so long now, so when this reveal was announced, I felt the universe heard my desires. Also, most of you already know how much I love 100% Pure, so getting a lip gloss from them was a total win - especially when the lip gloss has crushed semi-precious gems in it! The only problem? My box never came. When I checked the status on my package, it said it had been on the way to my apartment, but was being returned to the sender. Confused by this, I contacted the post office to see what had happened. I found out my usual mailman was on vacation, and the new guy hadn't known which apartment unit I lived in, so he didn't know where to place my package. Worried I'd never get my package, I contacted Goddess Provisions and let them know the situation. I really wanted my rose quartz sphere and lip gloss! They were happy to reship it for a small fee of $5, once it arrived back at their location. It took a while, but eventually I got my box, thank god. I suggest for anyone who has this problem in the future not to be afraid to contact Goddess Provisions. They were so eager to help and make sure I got what I paid for without having to repurchase the box. Now, without further ado, here's my in-depth review! Why you want it: This skillfully crafted aromatherapy spray will automatically transport you to days spent in a log cabin on a remote, forested island. 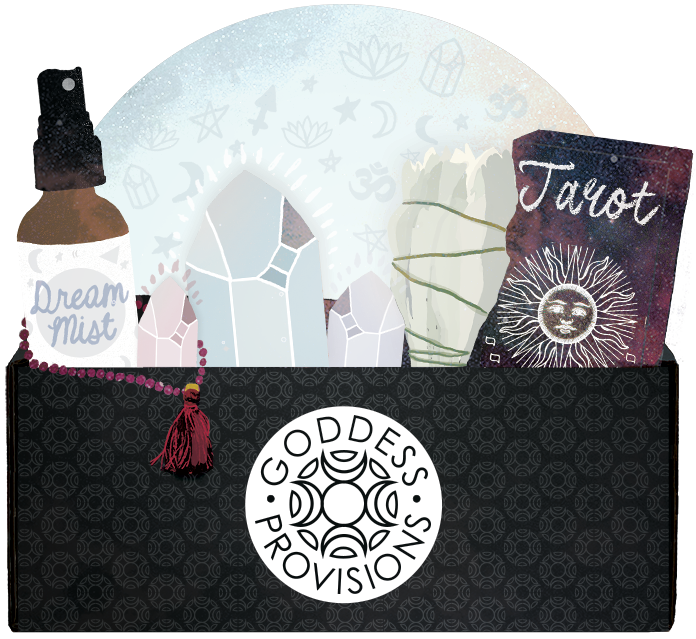 My review: I love how Goddess Provisions almost always has some sort of aromatherapy blend in their boxes. In the July box, there was one spray-on and one roll-on, so I wonder if they're aiming to create a pattern here, or if it's just coincidence ( I was once told there were no accidents, soooo...). Anyway, this month's lovely spray-on is not too harsh on the nose and is the perfect blend of cedarwood and lavender. I smell a mix of both, but the cedarwood is a little bit stronger, by just a smidge. 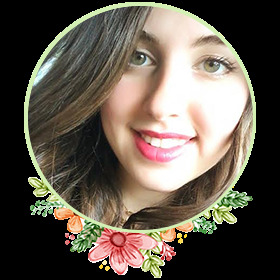 Unfortunately, the site its from doesn't list the ingredients in the blend, so if you're super picky and need to know exactly what's in all your aromatherapy blends (which I totally understand), this might not be for you. With that said, it's great for misting over yourself, a sacred space, or any room in your house to help balance out energy and relax you. I'd definitely recommend getting this if you like woodsy, earthy, but slightly spicy scents. 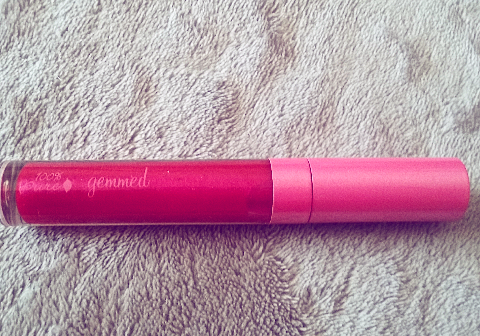 Why you want it: Perfect for the gem-obsessed lip gloss lover, this beauty leaves a subtle shimmer on your lips. 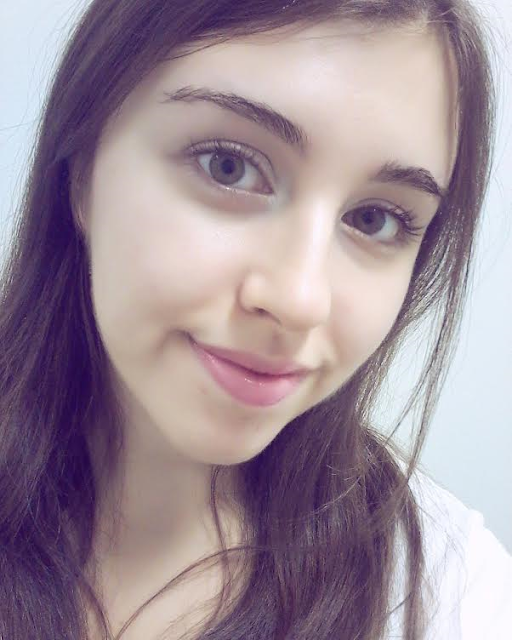 My review: If you've been following my blog, you know how much I love 100% Pure already. I trust their makeup because I know it's made with fruit pigments, and not icky chemicals. With this goodie, subscribers could have received one of three colors: Ruby, Citrine, or Crystal. I received Ruby and I'm so happy I did! It's such a stunning shade, and I love how glittery it is (don't you?). Either way I would have been excited to get any of the other colors, because they're all gorgeous. Made with real, semi-precious crystals such as pyrite, moonstone, and sunstone, this lip gloss enables you to give out real gem-kisses! It's not too bright or bold: Rather, it leaves a lightly tinted gloss over your lips that can be layered a little. I wouldn't suggest adding too much, only because it's a little sticky and doesn't feel good when you cake it on. However, a light layer will still get the job done and looks gorgeous. To apply, simply unscrew the cap and use the application wand to give your smackers some love (one coat on both the bottom and upper lip should do - don't forget to smack your lips together to even things out!). Another cool add in? The box this gloss came packaged in (which was a pretty hot pink in and of itself) is completely BPA and phthalate free, printed with biodegradable non toxic soy ink. Plus this product is cruelty free (like all of 100% Pure's products) and gluten free. Can you get any better than that? Apparently, yes: It's also vegan. Score! Why you want it: This light, airy roll-on aromatherapy blend reminds me of lavender - perfect for winding down or meditating. My review: Mindfulness is hard to come by in a day and age of Pokémon Go, social media, and other technological advances (but not impossible). We're all being told to multitask, to do complete our to-do list, to rush about our day. This little roll-on blend reminds us to step back, breath in, and be mindful. Taking a moment for ourselves is not weakness, it's essential. What I love about this blend is its calming, but simple fragrance of juniper and frankincense. The affirmation on the back of it is pretty zen too. Once you apply the roll-on to your desired area (wrists, neck, etc. ), inhale and affirm: I am more than my churning thoughts. I experience the deep richness of the now. This is designed to connect you to the present: Not always an easy task for go-getters (myself included). According to Soulful Essence, you can use this oil every time you meditate to create "a scent-memory bond that can bring you back your life enhancing mantra anytime you need it." So if you need to unwind and stop getting caught up in your inner voice, I recommend this soothing blend. 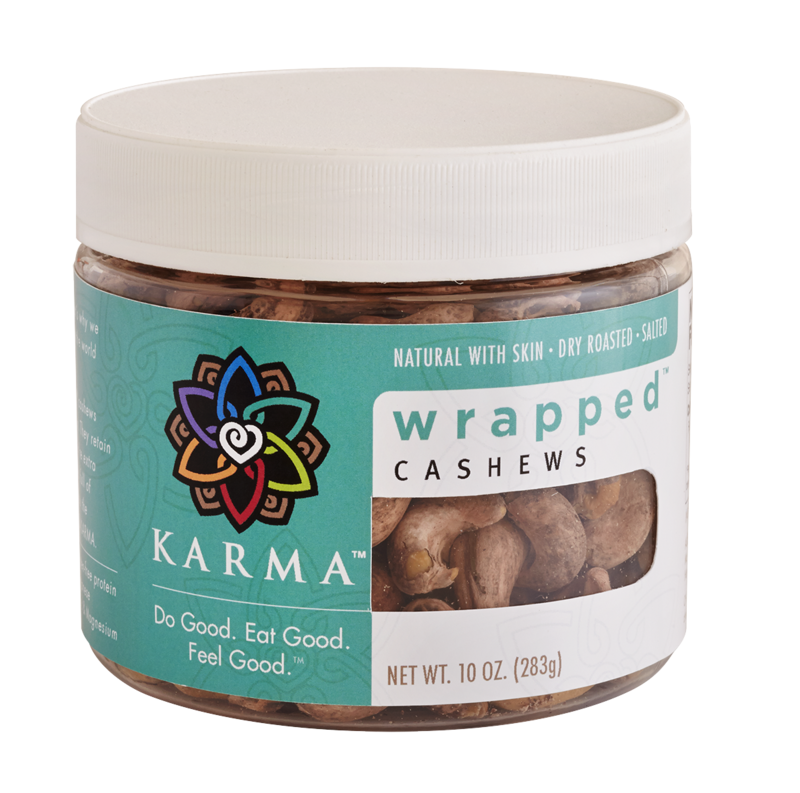 Why you want it: If you love cashews already, you'll love these even more (they're tastier, crunchier, and healthier!). My review: When I heard about this being one of the items in this box, I had my doubts. Sure, I love cashews (probably my favorite nuts), but I've never heard of eating them with their skin still on. These cashews retain their natural skins and are "air roasted" to keep them as healthy (and oil free) as possible. I was surprised at how much I liked them - in fact, I liked them so much I polished them in one shot and forgot to take a picture of them before throwing out the wrapper (yes, I recycled it. No worries). Silly me, huh? That's why the picture you see above isn't one of my own, but one from the company's website. What I liked most about these nuts was how simple their nutritional value is equivalent to the ORAC (Oxygen Radical Absorbance Capacity) value found in berries such as blueberries, raspberries, and blackberries. If that's not good enough, then the taste certainly is. I don't think I can go back to regular cashews after this to be honest, they were that good. The skin gave these nuts an extra saltiness that amplified their yumminess. So if you're looking for a quick, guilt-free snack loaded with good-for-you-fat, give these a go! Why you want it: There aren't enough non-toxic candles being sold in public places: This sandalwood and amber scented one is way better for the planet than what you'll find in generic candle stores. My review: Candles are magical: They're able to capture fire and keep it controlled just enough so we can admire it from a safe, comfortable distance. 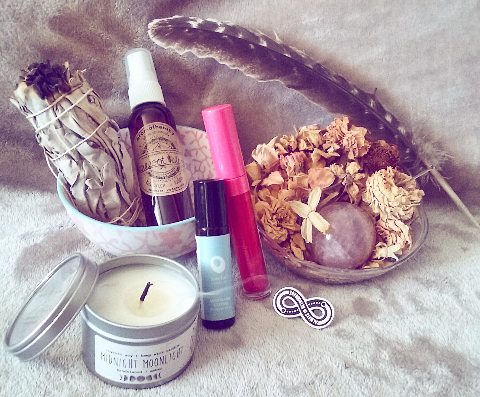 That's why I was so excited to receive this beautiful goodie in the August Goddess Provisions box. Not to mention, this one is made from organic soy and has a hemp wick: It's completely eco-friendly and sustainable. I've never had a candle like this before because I never see them for sale in any local candle stores. With a Yankee Candle or Bath and Body Works on ever corner, it can be hard to find sustainable candles. This candle definitely made me want to purchase more in the future, even if it's not necessarily with this company (though now I know it's a trustworthy one to keep in mind). 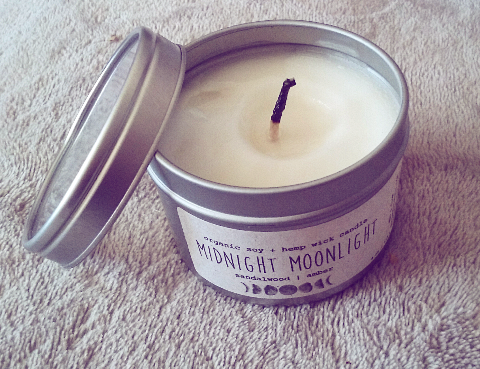 The scent of this candle is irresistible too. I can't stop smelling it. It's scented with sandalwood and amber, creating a sweet, but woody aroma. 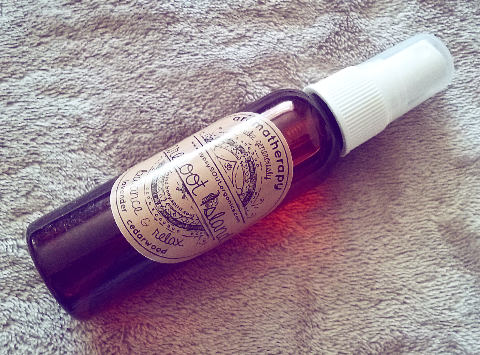 It goes well with the Barefoot Island aromatherapy spray I reviewed earlier because they both create the same woodsy, cozy-in-a-cabin feel. Its scent is very comforting. While not overpowering, it is powerful. Its smell is amplified when you light it too and can fill up a room. 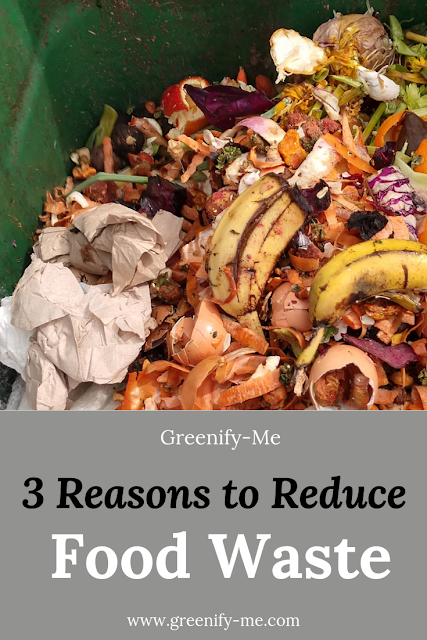 I definitely recommend this candle to anyone searching for an eco-friendly, hand-poured alternative to the toxic ridden ones at Yankee Candle or Bath and Body Works. Organic soy, hemp wick, sandalwood + amber (scents). Why you want it: Hate Mercury Retrograde? This humorous pin does too. My review: Not everyone is familiar with Mercury Retrograde, but here's all you really need to know: The next cycle lasts from August 30 to September 22. Astrologers mark this as a time when communication is flawed, technology goes haywire, and anything that can go wrong, probably will. It's not a great time in the year: That's for sure. What causes it you might ask? Mercury. In astrology, Mercury rules intelligence, travel, technology, communication, mind, and memory. However, when it goes retrograde, all these aspects of Mercury go out of whack. Expect commuting delays, wacky internet connections, conversations gone wrong, and travel plans interrupted. Don't believe me? Even the Huffington Post wrote an article about what not to do during Mercury Retrograde. You can even see for yourself by observing what happens over the course of the next couple of weeks. Thankfully, this pin understands Mercury Retrograde and makes light of it. After all, what better way to overcome craziness than with sass? 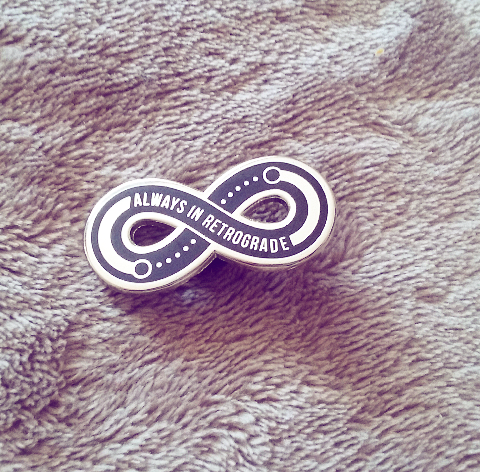 While I can't guarantee you'll have a better retrograde wearing this, I can say it'll be an interesting addition for anyone who loves pins. You can stick it on anything from your shirt, to your bag, plus its got a secure rubber pin back, so you won't poke yourself in the process (always helpful, trust me). Happy Mercury Retrograde! Why you want it: If you love the healing, heart warming energy of rose quartz, you'll love it in spherical form (it's fun to hold and roll around in your hand!). My review: I don't know many people who don't find rose quartz stunning: Named after the queen of flowers herself, it's hard to ignore. As I type this I'm taking mini breaks just to hold it in my hand and stare into its gentle, pale pink shimmer. 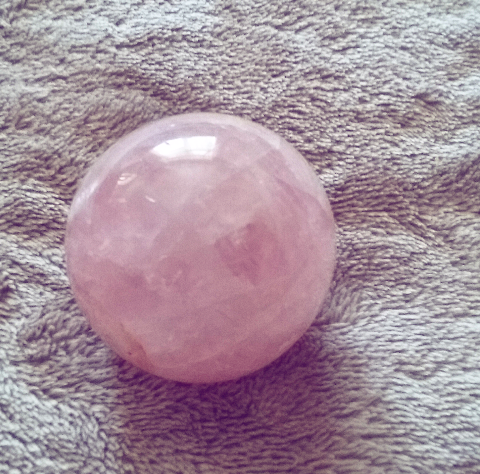 I've wanted a rose quartz sphere for a while now. They say there's a crystal for everyone, and I certainly feel this is the crystal for me. You can be drawn to crystals for a number of reasons: Maybe you just really love how they look, or maybe you know it has an energy all its own that wants to heal you. Whenever I see rose quartz I think of roses, yes, but I also feel love. Unconditional love, happiness, innocence, and sweetness. These are the qualities I value most in life and the attributes I strive to live by. Maybe that's why I'm so drawn to this crystal. Either way, I'm so glad I got my hands on it. If you'd like your own rose quartz sphere, I've provided a link above to Etsy where you can get rose quartz spheres in a multitude of sizes and prices. The smaller the sphere, the less money it'll be. Just remember: Rose quartz varies in color too. It can be very light, almost clear even, or dark pink. Make sure when you make your purchase you understand this and get the exact color and size you want. Mine is about the size of the palm of my hand and medium in color - not too light, not too dark. Perfect. I couldn't have asked for more. If you haven't experienced the healing power of rose quartz yet, you should. It'll open your heart chakra in a way you never thought possible (or at the very least make your eyes happy).